What to Expect? According to Mark & Brian, the format is relatively the same as any other BONEFROG event yet with one very diabolical twist. Each company will focus on what they do well. BONEFROG will produce the obstacles and GBC will incorporate their strength and endurance events throughout the race course. This combination will certainly challenge the best of the best OCR athletes as well as a great accomplishment for all athletic levels. Navy SEALs and Green Berets team up for one EPIC OCR! 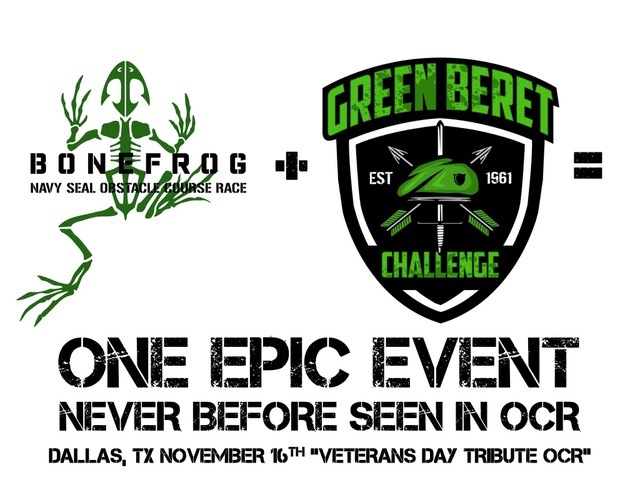 Green Beret Challenge joins forces with BONEFROG for their upcoming November 16th race in Dallas, TX. Since the inception of OCR dating back to roughly 2009, never have two major OCR companies aligned themselves to this degree. BONEFROG and Green Beret Challenge have announced their collaborative effort which will take place on November 16th in Dallas, for the already scheduled BONEFROG event. Knowing that both companies are veteran owned organizations, it’s not a coincidence this event falls in close proximity to Veterans Day. Brian Carney, former Navy SEAL, founder and CEO of BONEFROG Navy SEAL Obstacle Course Race Series, widely known for their innovative obstacles and multi-distance race series, have come on strong the past couple years throughout the OCR community. The Green Beret Challenge owned and operated Mark Ballas, former Special Forces Green Beret, is the diabolical creator of some of the most unique and challenging endurance events in the history of OCR. Together, Brian and Mark will combine efforts to produce what is anticipated to be one of the most epic races to date within the OCR industry. “We’re beyond excited to host this event with GBC and show what can be accomplished when two “Military Owned” OCR companies come together for one common goal – To give the racers something never before seen in the OCR space.” Said Brian Carney. Owner BONEFROG. Mark Ballas from the GBC added, “Brian and I have discussed this several times over the past couple years. We are stoked to finally be at a point where we can both do what we love to do and to demonstrate to the rest of the OCR industry that companies can work together for the betterment of the sport and our athletes”. Do you have what it takes to take on the FIRST EVER 2 in 1 OCR? Follow the link below and brace for impact as these two awesome OCR organizations come together to prepare a battlefield like none other!